Thursday, January 24, 2019 ~ 10:00 a.m.
Wednesday, January 23, 2019 ~ 5:00 – 7:00 p.m.
Sally A. 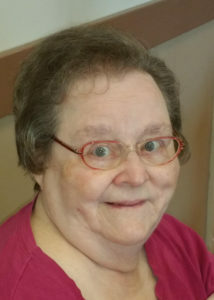 (Snow) Straw, 83 of Ashland, NE passed away Friday, January 18, 2019 at the Gretna Community Living Center in Gretna, NE. She was born April 17, 1935 in Auburn, NE. Sally was the 8th child of 12 children born to Howard and Mary (Woods) Snow. Eight of their children lived to adulthood. Sally grew up with her four sisters and three brothers in humble surroundings. She attended school in Auburn but was unable to finish due to an illness during her teenage years. Sally married David Straw, also of Auburn, on February 15, 1964. The newlyweds lived in Auburn where Sally and David were blessed with the first of their two daughters, Mary. Later they moved to Omaha for David’s job and were blessed with their second daughter, Beverly. In 1971 they moved to Ashland, where they raised their daughters and made their home. Sally worked earnestly in her home striving for a Christian environment to raise her children. She was active at the First Christian Church as a Sunday School teacher and volunteered in many other aspects of her church. After her youngest graduated high school, Sally worked at the city library. Sally enjoyed traveling and was able to visit Europe twice, many areas on the East coast and parts of the Southwest. She lived in Sierra Vista, AZ for about six months during the winter of 2008-2009; however Nebraska was always her home and she returned to Ashland in the spring of 2009. Sally is survived by her daughters and sons-in-law, Mary and Harley Fass of Ashland, Beverly and Charles Roettger of Sierra Vista, AZ; granddaughter, Kellie (Joseph) Morin; grandsons, Hunter Roettger, Cameron Fass; great-grandson, Michael Morin; great-granddaughter, Melody Morin; siblings W. Harold Snow, Lois (Ronald) Janicke, Bill Snow and many nieces and nephews. She was preceded in death by her husband, David Straw; parents; six sisters and two brothers. I lived across the alley in the mid 70’s from Sally and David. They were always very nice. She will be missed by all that knew her. R.I.P. We are so sorry for your loss, Mary. Your mom was a very kind person. Please give Cameron hugs from us. Our sincere condolences in the passing of Sally – such a pleasant person alway with a smile and caring of others. I recall living close by when we lived in the Marcy home. Our thoughts and prayers to Mary & Beverly and families and her brother and sister and their families. Our sincere condolences in the passing of Sally – Our thoughts & prayers go out to families. I remember living close by when in the Marcy home and Sally always so kind with a smile. I didn’t know Sally, but saw her obituary listed and I was just drawn to her since my name is also Sally. There are several of the days and years that are meaningful to me so I’m sure that is why I was pulled to her. I wish we could have met in life, as think we would have been good friends. I wish her family well and happiness for the future.